We already discussed why we suggest you register for Bing Ads in the first place, with "Adding to Your Advertising Aptitude," but we also wanted to walk you through an easy setup. It's similar to a Google AdWords setup, but there are a few quirks and best practices that could help you fully enhance your paid ads skills. Go to advertise.bingads.microsoft.com and click on the yellow "sign up" button. If you understand the basic setup, but want some best practices for your campaign, skip to step 7. Create your account. 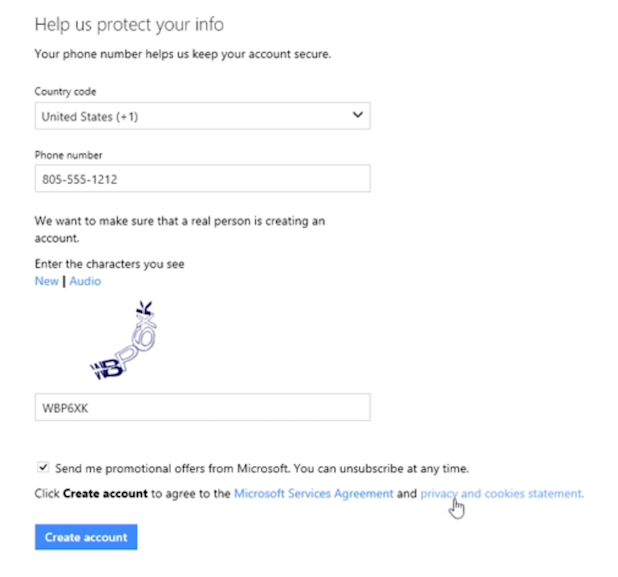 Similarly to Google Ads, you must create a microsoft account if you don't already have one. The next step has you enter some information. 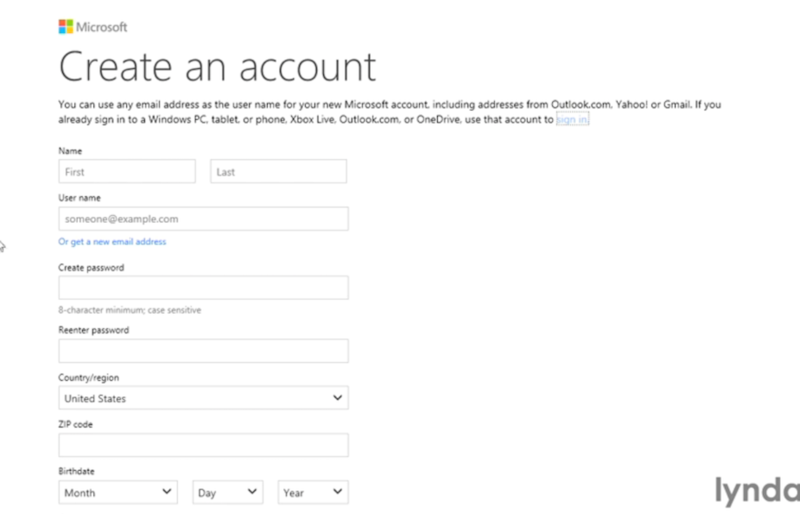 This step also allows you to link your normal email address to this account which is nice if you don't want to have to check your Microsoft email. They next ask for more information which will allow you to protect your account if your username or password is lost or someone else attempts to access the account without your persmission. They'll have you verify your email by going into whichever email you chose in step 3 and following the link within the message they sent. There's still more information they need from you such as your business information, time zone, language, etc. Now that your account is setup and confirmed, you have some options from which to choose. You can import data from Google AdWords if you have an account and want to replicate a previous campaign (see section 7.5a). If not, you can start a new one (see 7.5b) or simply skip this step for now - Option 3 - and instead go to step 8 of this blog. 7.5a) Option 1: Yahoo! Bing made it very easy to import from your Google account into your new one. When you're in your Google account, you can go into "file" - "export spreadsheet" - and click on "export current campaign." Save that file to the desktop. 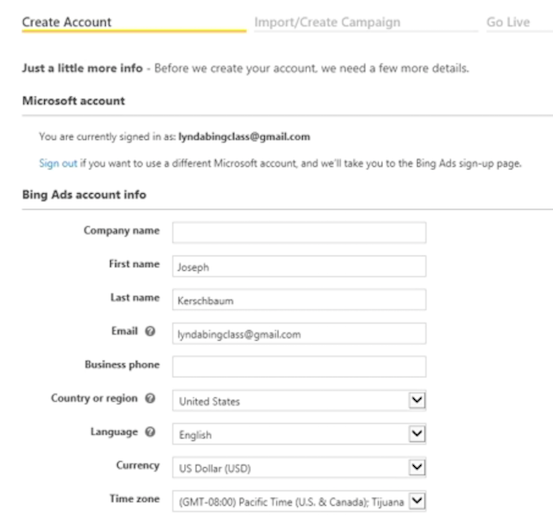 Then go into your Bing account, click on the yellow "import" icon, and select "from Google." You'll have the option of either signing into your Google AdWords account or simply using the file you just saved to your desktop in the previous step. After that it will ask you to make sure the import matches the settings on the Bing account - you simply check to make sure the phrases match between the two. Once you've uploaded, just check for any errors. 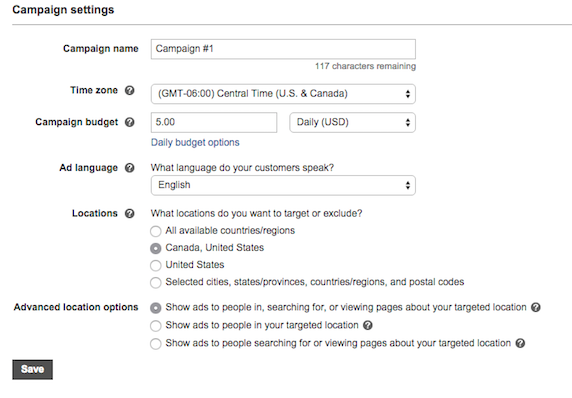 7.5b) To set up a brand new campaign, click on option 2: First they have you create an ad. You type in your ad title (what will appear in a larger font in blue, 25 characters), your ad text (more text explaining the ad, 70 characters), your display url (what will show up under the ad, 35 characters), and your destination url (the webpage that the display url will actually link to on your site). This will all largely depend on the campaign on which you're focusing. You'll want this to be targeted, with a specific goal in mind. For ArcStone, if we wanted customers to know that we provide marketing automation services and not just web design, we could make something like the ad below. Then we would link to a page that would show clients those services we pointed out, rather than all of our work. In this way, the people searching with this specific goal in mind are more likely to both click and convert, improving your quality score AND sales = which means a higher ROI for you. Next they'll have you choose your keywords: once you type in a keyword and hit "ad" it'll enter it into the bid section. 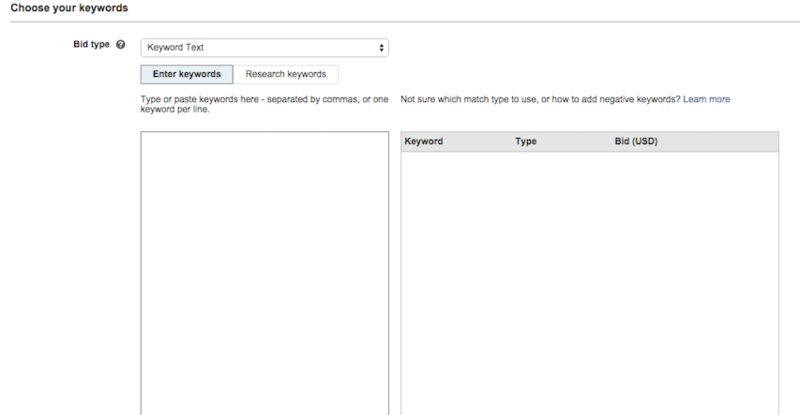 Your keywords can be thought of as answers, meaning that if a searcher enters a query, your keyword should answer it! Within your acocunt you can use the bing ads keywords research tool, found under "tools" and "research keywords" to improve your ad's effectiveness. You can also read about SEO tricks and searcher behavior in "The Silent Hand of SEO." In the section on the right, the drop down menus will have specify what type of keyword match it'll be selecting from: "exact" (your ad only appears if the search matches every single word of one of your keyword phrases), "phrase" (your exact keyword phrase is within their search query), "broad" (their search contains any keyword in your phrase, in any order), or "content" (any of their search words match with any of the words within your keyword phrase or any word in your ad title or text). At the beginning, broad is usually the safest bet as it gets you many matches, but it not as broad as content match would be. 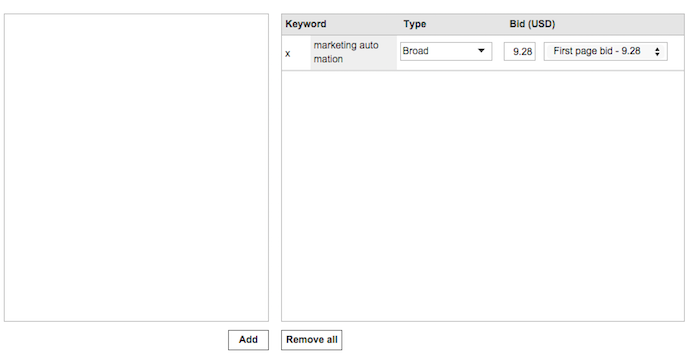 After keyword match type, you'll choose your bid and finally, what type of bid it will be. Bing offers suggestions for how much you should bid in order to get the placement you seek; your options are "first page bid" (gets you on the first page of the search), "mainline bid" (you bid the average bid paid by most of the advertisers of this keyword), "best position bid" (gets your ad on the top of the first page), "ad group bid" (creates a bid that applies to all the ads on that campaign), or "custom value" (you insert a custom bid that you created on your own). To get started, you want to bid high enough to get clicks and impressions but low enough so you don't waste money experimenting - to be safe, go for lower rather than higher and make adjustments later. You may want to go for "first page bid" to get some initial impressions and clicks for a better understanding of the ad's performance and where it can go from there. 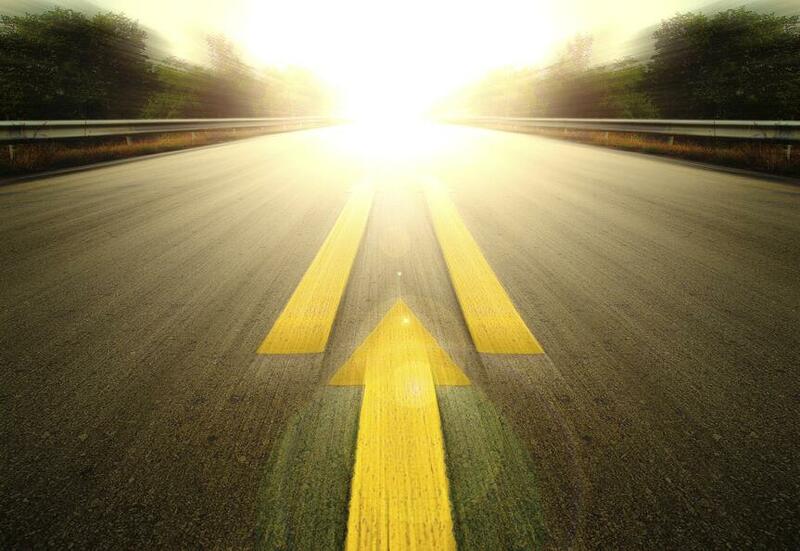 The final step of creating an ad is creating your campaign. These should be targeted only to the geographic area where you provide services (by default, Bing targets the entire U.S.). "Campaign budget" establishes how much you are willing to spend per day. If you select the drop down menu and click "monthly," Bing will spread this budget out for the month. If you click on "daily budget options" below the campaign budget section, you can select "standard" (uses your budget evenly throughout the day) or "accelerated" (Bing will try to gather as many impressions as quickly as possible). Lastly, you decide how you will pay. Make sure to use a credit or debit card that has flexibility just in case there are additional charges - if you don't have this option and payments fall through, your ads stop appearing until you resolve the issue. If any of this is unclear, or you want some more best practices, contact ArcStone to talk to one of our marketing professionals, or go to Bing Ads Help and search for your question. If you're still not sold on Bing Ads, but are interested in AdWords in general, read a Case Study on increasing conversions through Google Ads.